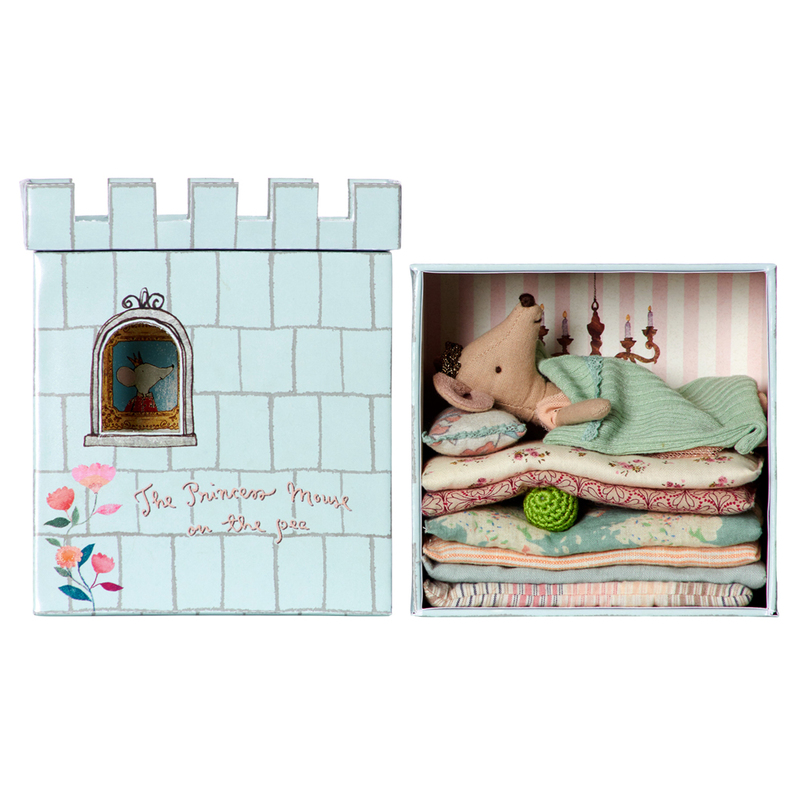 The original tale of the Princess and the Pea gets a Maileg makeover with this charming toy. A cute spin on the traditional story, Maileg Mouse and the Pea is a fun and whimsical way to get your child interested in this classic fairytale. This magical toy set comes with a sweet little Princess Mouse, who wears a gorgeous crown and lovely dress, and her impressive castle. This wonderful castle features a beautiful and colourful design with a cute little window. Designed to easily slide open or closed, the castle, which is also a box, contains many wonders. Inside, your child will find the princess’s special bed, complete with multiple soft and cosy mattresses. However, no matter how many mattresses she has, Princess Mouse can always feel that small green pea lying under her bed. Perhaps your little one can help her find and remove it so that she can get some good shut-eye? This delightful Danish label creates beautiful toys designed to inspire little one’s imaginations. In a world of constant noise and distractions, Maileg is all about slowing down and getting lost in a world of wonder. In the Maileg kingdom, cats and rabbits live alongside each other, bunnies take ballet lessons, and matchboxes and cardboard boxes become beds and rooms for little mice. Founded by Dorthe Mailil in 1999, Maileg has grown from small beginnings into an award-winning, global brand with a ever-growing range of gorgeous products. Each piece is made with a focus on quality and designed to last for many years. The range encourages children to use their imagination and explore the world around them through active play. The label’s range of rabbits, bunnies and mice are a particular favourite. 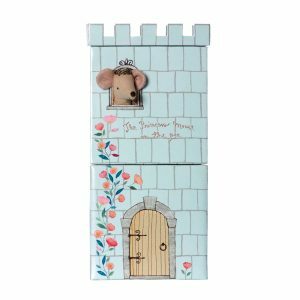 As well as a whole range of characters, you will also find a collection of clothes, furniture and more for these small creatures to adorn their little home with. In sizes suitable for a dollhouse through to creatures big enough for bedtime cuddles, you’re sure to find something that will delight the child in your life. This assortment of food could be all the food your Maileg friend possibly need. 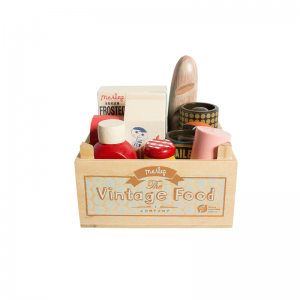 A lovely Maileg Wooden Vintage Grocery Box decorated and filled with cereal, jam, salami, ketchup, milk, coffee, beans, a baguette and a cheese block. Each piece of food is made of solid wood and hand decorated. 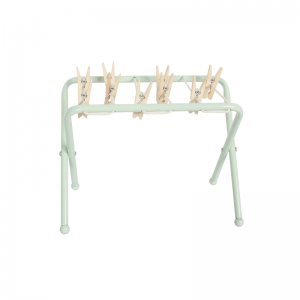 This sweet Maileg Metal Clothes Post with Pegs is a gorgeous role play addition to your Maileg collection and comes complete with wooden peg and folds flat for storage. This Clothes Post goes with your MY and Micro Animals. A micro sized Maileg Bunny measuring 16cm. Maileg's adorable mico bunny is sturdily made from cotton with a sweet embroidered face and dress in a floral nappy. Maileg’s micro bunny makes for a lovely gift as well as a great start to your child’s own Maileg collection. This classic, timeless doll is sure to be treasured for a forever. All Rabbits and Bunnies come dressed in their underwear and are machine washable. Please select an outfit. Maileg Sister Rabbit measuring 86cm. A Mega Maxi Bunny sturdily made with a well stuffed cotton body, long ears, dangly legs and arms and lovely face. Don't forget the lovely details on the removable clothes! This classic, timeless doll will be a very special gift treasured for a lifetime. 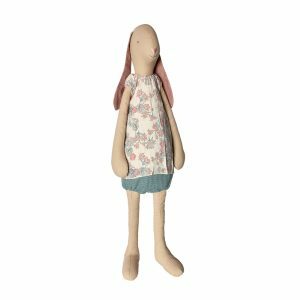 Maileg’s Mega Maxi Bunny makes for a sweet gift as well as a great start or addition to your child’s own Maileg collection. Underwear pattern may vary to image shown. A medium sized Maileg Brother Rabbit measuring 50cm. A Medium Boy Rabbit sturdily made from cotton with a sweet embroidered face and dress in a grey print vest and stripe pants. 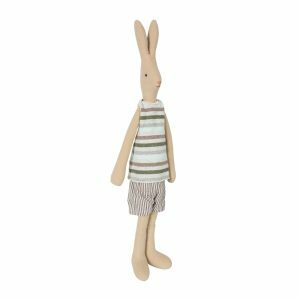 Maileg’s Medium Boy Rabbit makes for a sweet gift as well as a great start or addition to your child’s own Maileg collection. This classic, timeless doll is sure to be treasured for a forever. All Rabbits and Bunnies come dressed in their underwear and are machine washable. Please select an outfit. 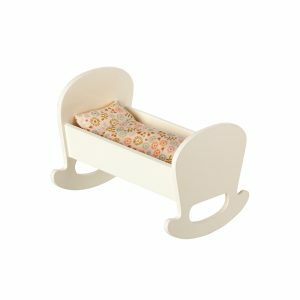 Rock-a-by baby mouse will sleep nice and cozy in this rocking cradle. Made of wood and comes with bedding to keep baby nice and warm. This size fits our baby mice and My size bunny and rabbit. Approximately 9.5cm tall. A micro sized Maileg Rabbit measuring 16cm. 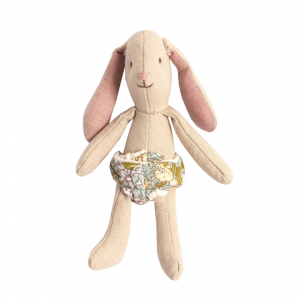 Maileg's adorable mico rabbit is sturdily made from cotton with a sweet embroidered face and dress in a floral nappy. Maileg’s micro rabbit makes for a lovely gift as well as a great start to your child’s own Maileg collection. This classic, timeless doll is sure to be treasured for a forever. All Rabbits and Bunnies come dressed in their underwear and are machine washable. Please select an outfit. A medium sized Maileg Brother Rabbit measuring 67cm. A Maxi Boy Rabbit sturdily made from cotton with a sweet embroidered face and dress in a grey print vest and stripe pants. 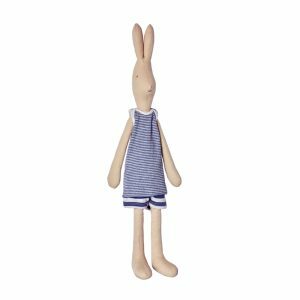 Maileg’s Maxi Boy Rabbit makes for a sweet gift as well as a great start or addition to your child’s own Maileg collection. This classic, timeless doll is sure to be treasured for a forever. All Rabbits and Bunnies come dressed in their underwear and are machine washable. Please select an outfit. 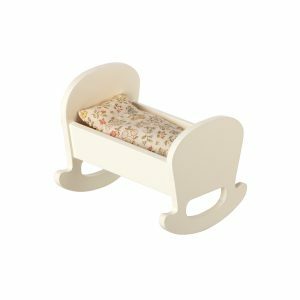 Rock-a-bye baby mouse will sleep nice and cozy in this rocking cradle. Made of wood and comes with bedding to keep baby nice and warm. This size fits all Micro bunnies, rabbits and the big brother and sister mice. Approximately 12cm tall Made of wood and suitable for children 3+ years. This sweet deer is the newest member of Maileg' family. She is beautifully constructed and has amazingly thoughtful detail on each side. It's weighed on the bottom and can sit still. This classic, timeless doll is a perfect night time companion and is sure to be treasured for a forever. 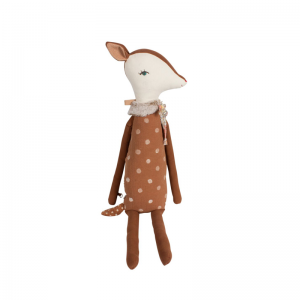 Maileg’s Bambi makes for a sweet gift as well as a great start or addition to your child’s own Maileg collection.